Muzhenko’s statement drew howls of protests from Ukrainian soldiers and political activists, angry at the suggestion that blood had been shed for no purpose, but he is probably right. And Shirokino is hardly an isolated example. It is a sad fact that war often descends into bloody struggles for territory which has no tactical or strategic value, only symbolic importance. War is not a very rational endeavour, if one measures rationality in terms of material costs and benefits. Rather, as I examined in my book Military Honour and the Conduct of War, it is about honour as much as anything else. Why else keep attacking Passchendaele? Why else throw the Sixth Army deeper and deeper into Stalingrad? Why else keep on fighting the Taliban long after it has become obvious that you’re never going to defeat them? The answer is that honour, under whatever name you choose to give it – face, prestige, credibility, reputation, self-respect, pride – is at stake, and so you keep on at it, however unsuccessful it may be. According to Clausewitz, war is a means of achieving a political objective. The tactics chosen will thus reflect the objective in question, which may change as the war develops. At the start of the war in Ukraine, the Ukrainian government’s object was to recapture its lost territories. It therefore focused its attention on capturing land and on strategic manoeuvres designed to destroy the enemy occupying that land. Now, though, it is quite obvious that recapturing the entirety of Donbass by military means is impossible. The objective, therefore, has changed. After the humiliating defeats at Ilovaisk in August 2014 and Debaltsevo in February 2015, restoring lost pride is the only objective achievable. And so, the Ukrainian Army fights over villages which have ‘no military value whatsoever’ because they come to symbolize that pride. It is, in a way, rather more logical than it initially seems. This, then, is what the war in Ukraine has come down to: restoring Kiev’s damaged pride. Ever since the Minsk-2 agreement in February this year, both sides have been shelling each other daily, probing each other’s lines, and exchanging small arms fire, without gaining more than a few yards here and there. From a military point of view it doesn’t make sense. But from a political point of view, abiding strictly by the terms of Minsk-2 would have meant that Kiev would have had to accept a political settlement forced upon it by a victorious enemy. The current small-scale fighting doesn’t bring Ukraine any closer to a military victory, but it prevents that humiliation. If the warring parties in Ukraine weren’t fighting over Shirokino, they would have just have to fight over something else. In essence, fighting itself has become the aim. Muzhenko’s comment suggests that the General Staff don’t like this very much, and as a former army staff officer, I thoroughly sympathize. But given the prevailing political mood, I fear that there is very little that the General Staff can do about it, and the struggles over useless objectives will continue for some time yet. 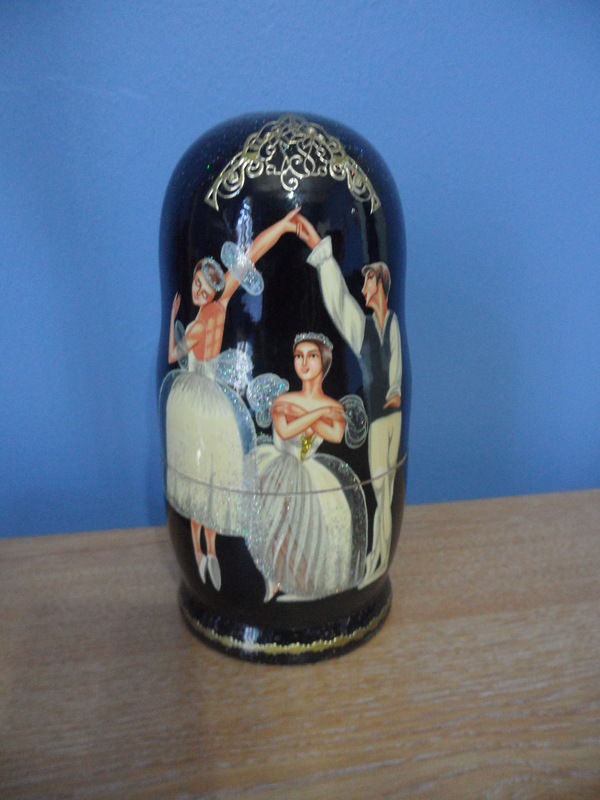 The last in my series of Russian ballet-related objects is this ballet matrioshka. This seems to be the season for reports about Russia. Hot on the footsteps of the Bow Group report last week, another volume has just landed in my mail box – a booklet from the Canadian Security Intelligence Service (CSIS) entitled Russia and the West: The Consequences of Renewed Rivalry. The report (which is available online) is a summary of a workshop held by CSIS’s Academic Outreach program. As the workshop was held under Chatham House rules, and as I wasn’t invited to the event, I can’t tell whose opinions are reflected in the document (though I could make some guesses). Also, the fact that what were probably 30-40 minute presentations have been reduced to 2-3 page summaries means a lot of sweeping generalizations and broad brush conclusions without much substantiation. As a result, the report is of limited use. Nevertheless, it does show what advice the academic community is giving government agencies in the West about Russia. Some of it, such as the sections on the Russian intelligence community, business and politics in Russia, and the effects of sanctions, is o.k. Others parts are less sensible. The overall tone of the report is negative, putting the entire blame for current tensions in Russia-West relations, as well as for the war in Ukraine, on Russia. In the chapter on the Ukrainian conflict, there is a brief spark of recognition that things may be a bit more complicated than normally depicted, with a statement that, ‘Ukraine’s non-compliance with the [Minsk] agreement has now become glaringly obvious’, but this is little more than a blip in the general narrative. There is a clear historical link between Russia’s top-down form of government and Moscow’s imperial record. … That understanding includes the presumed right and need to dominate neighbouring regions. … What we have today is a set of legally protected myths which glorify the past. Stalin and the Great Fatherland War are its core elements. … The reality of rule by a narrow, self-interested and in part nervous cabal is by now imperfectly concealed. … Russian decision-makers have insisted with increasing vehemence that their principal antagonist is indeed the West. … It is hard for Western observers to grasp the meaning of such hollow narcissism. … Does Moscow really not understand why so many of its neighbours are afraid of it? … The logic of Russian policy is that the Kremlin should impose its rule by proxy on Kyiv. … Putin’s Kremlin is trying to force Russia into a mould that rejects its European heritage. This reflects a common Western perception that autocratic, or at least imperfectly democratic, states are more aggressive than liberal democratic (i.e. Western) ones. And yet, most scholars who have studied the subject believe that while democracies rarely if ever fight each other, they are not in fact any less aggressive than other regime types. Martin Malia convincingly showed in his book Russia under Western Eyes that Russophobia in the West has rarely had any relation to the actual threat Russia has posed. When Russian leaders’ domestic policies have been viewed favourably, Western commentators have turned a blind eye to Russian imperialism, but when its leaders have been viewed as tyrannical, the West has vastly exaggerated the Russian danger to its security. 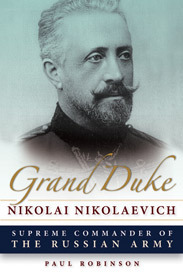 Thus, public opinion in the West was vehemently anti-Russian during the reign of Nicholas I, even though Nicholas refrained from aggressive military actions, but it was very pro-Russian during the reign of Catherine the Great (perceived as an enlightened ruler) even though Russia expanded enormously. The idea that centralized and autocratic rule makes Russia a threat is without solid basis in fact. Next, the idea that Stalin is a central part of Russia’s contemporary self-image is somewhat bizarre. Certainly, the Great Patriotic War plays an important role in Russian identity (as indeed does the Second World War in some Western nations), but Russians aren’t all neo-Stalinists. As for Russia’s alleged ‘hollow narcissism’, this charge is not entirely without foundation – Russian fears of Western hostility are, I believe, exaggerated, and there is a tendency for Russians to think that Western actions are directed against them when they are not. But there are some good reasons for it. Take, for instance, NATO’s proposed European anti-ballistic shield. I tend to the view that NATO planners really do see this as protecting Europe against Iranian nuclear-tipped missiles, and not as a tool against Russia. But I fully understand why Russians don’t agree. After all, the Iranian nuclear missile threat doesn’t exist. Accepting NATO’s claims means accepting that its leaders live in strange fantasy world. It’s easier to believe that they are rational, in which case, the anti-missile shield must have an alternative target, i.e. Russia. Russian fears do have some foundation. And while it is true that Russia’s rulers do not seem to realise how their actions in Ukraine might frighten some Europeans, this report makes it very clear that many in the West are equally incapable of seeing how Western actions might frighten Russia. This lack of self-awareness, on both sides of the Russian-Western divide, is a major cause of current tensions. Finally, the claim that the Kremlin ‘is trying to force Russia into a mould that rejects its European heritage,’ is not untypical of comments in recent months which like to emphasize Russia’s alleged ‘turn to the East’, the supposed influence of Eurasianism, Putin’s increasing conservatism, and so on. But it is a huge exaggeration. The fact that Russia is trying to increase its ties with its Asian neighbours does not in any way mean that it wishes to cut its ties with Europe. On the contrary, President Putin, Foreign Minister Lavrov, and others have made it clear that this is not their intention. Moreover, Russia’s ‘European heritage’ is a cultural phenomenon which runs so deep that rejecting it is simply impossible. The report’s final chapter concludes that ‘the relationship [between Russia and the West] is going to be cold, unproductive, and adversarial in certain areas, and will offer minimal opportunities for successful mutual cooperation.’ This fate can be avoided. But doing so will require a change in attitudes not only in Russia but also among those in the West who perpetuate negative stereotypes. 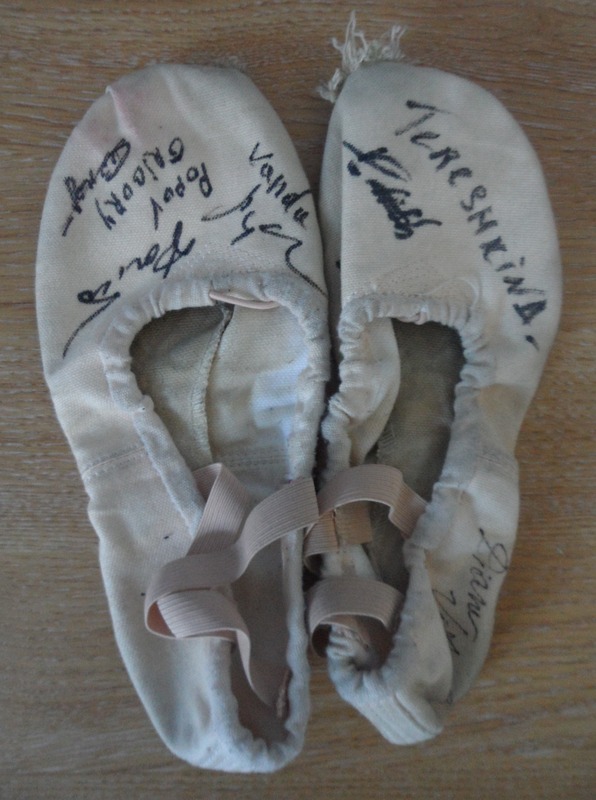 The third in my series of Russian ballet objects is a pair of well-worn ballet slippers signed by members of the Kirov (Mariinsky) Ballet Company, including one of the current stars, Viktoria Tereshkina. Given a choice between a simple explanation and a complex one, I favour the former. So, in time of war, if a shell lands behind the lines of one side, I tend to believe that it was fired by the other side, rather than being ‘friendly fire’, a ‘false flag operation’, or anything else. This means that when shells hit Donetsk, I consider that the Ukrainian Army is probably responsible, and when shells hit targets behind the Ukrainian lines, the rebels are probably responsible. This Sunday, artillery struck the Ukrainian-held Mariupol suburb of Sartana, killing two civilians. The logic above makes me believe that the army of the rebel Donetsk People’s Republic is most likely to blame. Local people at the scene, telling the Kyiv Post that the town had been shelled by the Ukrainian side, called on the media to ‘tell the truth.’ ‘If it had been the (Russian-separatist forces), they wouldn’t have left a stone standing here!’ said Natalia, a 43-year-old woman who was too afraid to give her full name. She blamed those who ‘danced on the Maidan,’ for the attack, adding that ‘the war will be finished and we will live in happiness as soon as the Ukrainian army is away from the Donbas.’ A dozen people around her supported her claims. Serhiy, 56, who also wouldn’t give his full name, showed a handful of shell fragments, saying they were from small-caliber mortar shells that couldn’t have come from separatist positions, as these were too far away. It would appear that people who dislike the Ukrainian government and army believe that those institutions must be responsible for their suffering, regardless of any evidence to the contrary. But that begs the question of why they dislike the government and army so much. Sartana was ‘liberated’ from the rebels over a year ago. The Ukrainian authorities have had plenty of time to prove to its inhabitants that ‘Russian propaganda’ is false, and to win over their hearts and minds. And yet it seems that they have utterly failed to do so. A year of ‘liberation’ has left such a legacy of hostility that people yell abuse at journalists who dare to suggest that government forces are not to blame for their problems. This is a sobering thought. Given that many people in Ukraine actually consider themselves to be Russian, and that the justifications for sanctions may have shifted, it appears necessary to revise our approach to what could be considered one of the greatest challenges of the 21st century. We might do worse than explore for [sic] a peaceful solution to this crisis, engaging EU member states and Russia in a meaningful and inclusive dialogue. 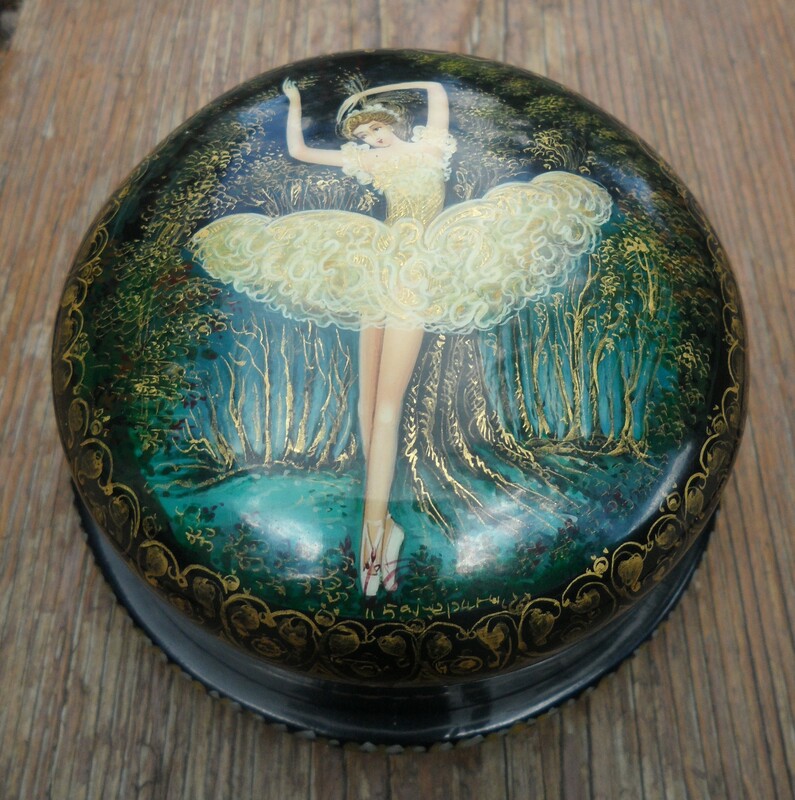 The second in my collection of ballet-related objects is a lacquer box depicting a ballerina, which I bought in Moscow a decade or so ago.